Atlas Bolt & Screw offers KwikFlash, a weatherproofing flashing which consists of aluminum stretch netting cast in environmentally friendly lead-free polymer rubber, which allows it to take a form set while remaining flexible, malleable and stretchable. A fully self-adhesive butyl layer underneath the rubber polymer is protected and backed by a release sheet removed during installation. 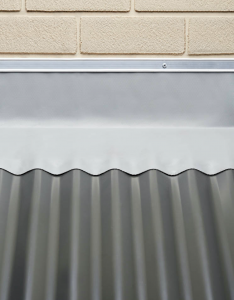 Applications include difficult-to-flash areas such as skylights, square and round ducts, parapet walls, and in areas where traditional lead flashings are used. The product is compatible with most materials and can be successfully flashed between brick, fibre cement, galvanized steel, aluminum, stainless steel and concrete. According to the manufacturer, it is lightweight, easy to trim and no fasteners are required for significant labor savings. Don Bratcher has been promoted to the position of president of Atlas Bolt and Screw. He will have complete responsibility for all Atlas’s North American activities, including the branches in Ashland, Ohio, Flat Rock, N.C., Salem, Ore., and Houston, as well as the company’s manufacturing plant and corporate offices in Ashland. Bratcher joined Atlas in April of 2015 as the business unit manager for the Wood Segment, and he has overseen many programs to drive significant improvements in both operations and customer service. Bratcher’s career spans more than 25 years, including service with Butler Manufacturing, a designer and manufacturer of metal buildings. At Butler, he successfully managed commercial activities for 16 years and then transitioned to a general manager’s role with full P&L and operational responsibility for the company’s Western region.